While traveling Vermont to reflect, connect and discover, the need to also temporarily put the journey on hold proved necessary as finding a lunch place with a bathroom stop took the forefront. Taking a pause during the Vermont travel experience actually created a deeper pause when entering the Putney General Store in Putney, Vt.. The quaint-looking general store in a quintessential small southern Vermont town instantly became part of the day trip’s reflecting, connecting and discovering of the Green Mountain State. This was not exactly the faceless highway service station stop where people don’t care about the experience and, dispassionately, are only concerned with making it in time for that cup of coffee, fast food burger and restroom visit. The Putney General Store’s traditional local Vermont community gathering place vibe (Vermont’s oldest general store, actually) — clearly possesses a regional personality high on charm, authenticity, and a one-of-a-kind look. Sure, the Putney General Store has a close relation to many other Vermont general and country stores in appearance, but the lack of pretension and humble nature seem more pronounced. The mix of rural stillness in the air and on the streets with a bustling small town, small business vibrancy inside the store holds a special feeling that can only be experienced by just going there. 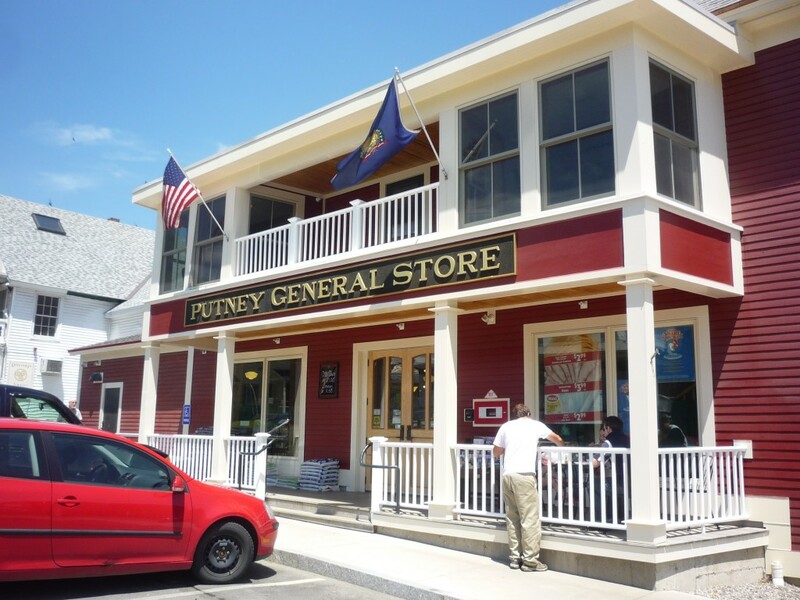 The presence of the Putney General Store is great news for locals needing a place to meet and travelers looking for a friendly general store that blends in well with the overall Vermont experience as opposed to a generic stop along the way. Here is a genuine, historic general store that features grocery items, a deli, breakfast items, homemade baked goods, a coffee bar, beer and wine, local produce and products (like maple syrup and dairy items) and gifts. This is not your basic “10 minutes, please” sub shop, as evidenced by ambitious items like the “The Old Timer”: turkey, bacon, cheddar cheese, apple slices and a house barbecue sauce on a pressed white bread panini. Or how about “The Chai Lady”: black forest ham, creamy brie cheese, sliced pear, baby spinach, and an orange-chai reduction, on whole wheat toast? Amazingly, these creative sandwiches come in, at this writing, well under $10! It’s really a great “cheap travel” destination for those that are dedicated to budget travel and good value for the money. Good, too, that there is indoor and outdoor dining to enjoy a sandwich and coffee — or whatever food and drink selection that appeals to you — that is not all too common in Putney and the surrounding area. They even have a pharmacy, further helping make the Putney General Store looking like some scene out of a “feel good” 1940s movie depicting small town life. The locals seem to love it here, and actually helped save The Putney General Store after, sadly, suffering through two separate fires in 2008 and 2009. Amazingly, the Putney Historical Society and local residents helped raise a significant amount of money to bring this landmark store back to life with a 2011 reopening — that’s remarkable resolve in a town of around only 3,000 people. The store’s traditional, rustic retail template — that goes all the way back to the 1700s — has remained, but let’s not forget that we crave 21st century conveniences, too. So, free Wifi, being open early morning to mid evening hours, gluten-free requests and accepting credit cards goes a long way in pleasing the modern day customer. If living in Putney, I’d come here every day for some good food and conversation. It’s that good, but as a visitor the experience also holds a special feeling — that is, after visiting the Putney General Store, there’s that great, kid-like feeling of hoping a return visit happens as soon as possible. Every town should have a place like this! ← The Beautiful Simplicity of Jane and Paul’s Farm in Norfolk, Mass.